The Ozeki WPF SoftPhone Sample is a simple softphone sample program. It is for presenting the significant and easy to use services that Ozeki VoIP SIP SDK offers. With this program you have the opportunity to make and receive calls. It is also for sending and receiving DTMF signals that are for navigating in IVR systems. Windows Presentation Foundation (or WPF) is a graphical subsystem for rendering user interfaces in Windows-based applications by Microsoft. WPF employs XAML, an XML-based language, to define and link various interface elements. WPF applications can also be deployed as standalone desktop programs, or hosted as an embedded object in a website. WPF aims to unify a number of common user interface elements. How to develop C# WPF softphone? The GUI of this sample program has been developed with Microsoft WPF (Windows Presentation Foundation) technology. The reason for this is that it allows great flexibility regarding the appearance of the program. This flexibility is only limited by your imagination. The main goal of this sample program is to demonstrate the simple and convenient use of Ozeki SDK. 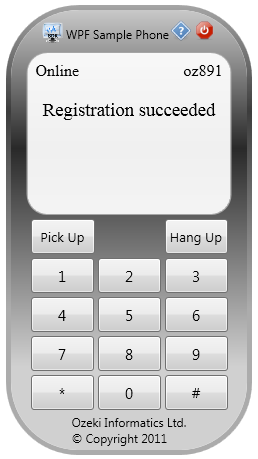 That is why to create a simple but representative GUI (Figure 1) with basic telephone functions. The softphone has all the functions that are required for establishing phone calls effectively like to make a call, to receive a call, sending and receiving DTMF signals and display of call events on the interface. The difference between the Windows Forms softphone and the WPF softphone is mostly only the handling of Graphical User Interface. To learn how to develop a softphone in C# which would use GUI, you can visit the Windows Forms Softphone article. You can learn much about functions and features of softphones from the Softphone Development Basics chapter, and from the Training chapter as well.